In this two-day class you'll learn to make wholesome soaps using old-fashioned ingredients and modern methods. Using vegetable oil, lye and water you'll make your soap. Then you will create your own unique scent blends with essential oils. On the first day, you'll learn all about different oils for different soaps and you'll make soap. The second day, you'll cut and package your soaps. Pre-registration required by two weeks before the class. Registration- $43; The remaining class and materials fee of $200 is due directly to Linda at the beginning of class. Linda accepts cash, check or major credit cards. Multi-talented crafts person Linda Odom is known for her fun and patient teaching style. A popular fiber arts instructor, Linda took over the soap shed at the Ozark Folk Center in 2011 and opened the Village Apothecary Shop in 2012. Her many naturally scented soaps keep that whole corner of the craft village smelling clean and sweet. 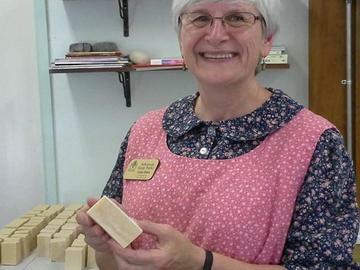 In her soapmaking classes you are sure to have fun and come out with the ability to continue in your new skill. You must be 16 or older to take this class.